The Night Was Black, As Was The Oil, And The Jib Came Tumbling Down. I'll double the inheritance of either of my sons who can tell me what song the above line parodies. (Let's see 2x0 still equals 0, except of course for the liabilities). After all the questions about the "gunky motor", Barb and I motored out of Boca Chica, Panama heading for Bahia Honda around 1730. We took one of the alternate exits and found it easier than the usual one. We had dealt with the gunky oil by changing the oil and filter, filling the engine with diesel and running it briefly, and pumping it out and changing filter again. It worked! The gunk from the raw water pump seal leak was gone. The shallowest point at this entrance was about 12' instead of the 6' on the other. After a modicum of motoring for no more than an hour, we raised sail to about 7 knots on the Starboard quarter. It moved us nicely at about 4 knots. An hour later, just as the sun was setting, the wind switched 180 degrees in a sudden blast of cold air. It progressively grew stronger, and by 2100, it was strong enough for me to take a reef in the main; over 15; a little later it was up to 20, so I had Barb head into the wind so I could furl the Genoa. We restarted the engine at that point but only put it in gear long enough to keep it into the wind. Actually, I knew the wind gauge was in error since Passage Weather and FNMOC, agreed, that the strongest winds in a two day span around Panama would be 10-15, and we know the Navy is never wrong. I pulled the furling line and brought in maybe 1/4 to 1/3, when it would pull no further. Since the wind was now over 20 and the sail flogging, I thought the sail may have over tightened the furling line, and there was no more wraps of line to bring it in the rest of the way. The wind was now over 25, spray was rampant and our options were limited. There was vessel traffic on our port (most likely fishing boats running for home), preventing making drastic further moves to upwind. 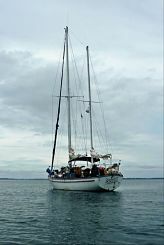 With a few Panama islands and rocks 2 miles to our lee, we couldn't run with the wind. I chose to keep it on a beam reach, but easing the sails to the point of luffing some, to keep things under control. We were making over 6 knots and the beam seas, while building fairly quickly, were not bad at 2-4 feet, flat faced. We made it past the Panama Islas Secas, and just as I was preparing to run down wind a bit there was a "Bang" and the Genoa came down into the water, quickly bringing the boat to a near stop as it scooped full of water. Not knowing what had happened, I assumed that the weak link, a smaller "D" shackle had broken, and that the entire sail was streaming along side the boat, which was still on a reach, with only the reefed main. Our speed was now .04 knots, and we were "beam to" over 25 knots, and a building sea. I did not want run a chance of picking the end of the sail into the propeller or rudder, so while the engine was running, I did not have it in gear. I went below, and turned the prop shaft by hand and was pleased to find it free. I pulled on the sail in the water, and it seemed to be firmly anchored and would not budge from its hold on the depths. We were four miles past the Islands, and the channel to leeward was between the Secas, and Contreras, a 12 mile wide gap used only by sports fishing boats, all of which would be safely in the slips and beds tonight in these conditions. 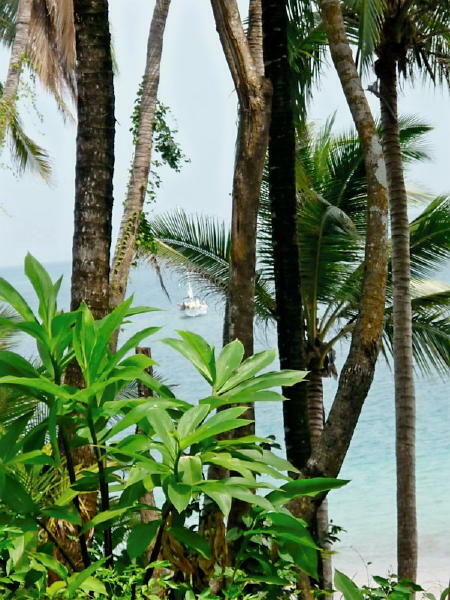 To be sure, there were a number of small Panama commercial panga fishing boats. Spray was now flying the length of the boat, and waves were slapping us, still not too big, but less comfortable all the time, now about 5-6'. 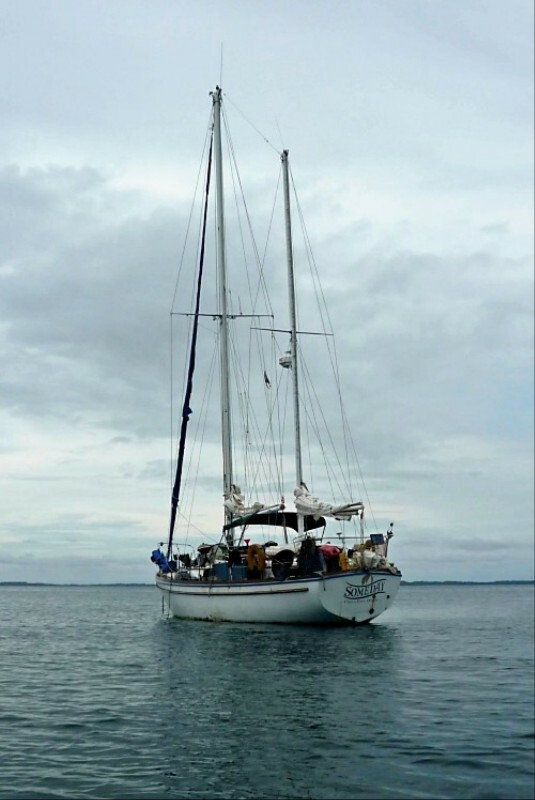 Our set line was clear, so we shut down the engine, leaving lights and radar on, with the main still reefed and trimmed to a close reach, and proceeded to drift the night away, to deal with the sail problem in the dawn light. Barb took the first watch, from 2330 until I awoke from my depression. About 0200, I took over. About 0315, our drift had taken us to within 2 miles of the Secas, and it’s very dangerous outlying rock. The anomaly was that our bow was pointed roughly east, the wind was from the North, and we were drifting West, obviously totally a slave to the current, with the sail in the water The wind had dropped substantially to less than 10, and our net speed was .02 astern to the West. I went below and awakened Barb then went forward to scope out the sail more clearly. It was not nearly as bad as I had feared. The head was still attached at the fore-stay as only the halyard had parted, and the foot attached to the deck, so it was bent into a "U", and nowhere near the prop or rudder, as feared. Now that I was not firmly intimidated by the rough seas and screaming wind, the situation was manageable, in spite of moonless darkness. For some strange reason, it never occurred to me to turn on the spreader lights to see what I was up against. I turned the boat so the sail was on the windward side, which helped the boat float away from it and get it out from under the hull. Then I simply pulled it aboard with only my arm strength. My technique was to pull until it got very hard, then let water flush from it for a few seconds, and pull some more. In a surprisingly short time, I had it all aboard and inside the lifelines. The main was now pulling us forward at a knot or two, and had steerage. The wind was about 7 knots, from the North, and the seas down to a quite comfortable level of a foot or two. The furling had jammed because the arm on my new 45# CQR anchor was longer than the old 35# and had found its way into blocking the furling drum from turning. Very easy fix once determined. 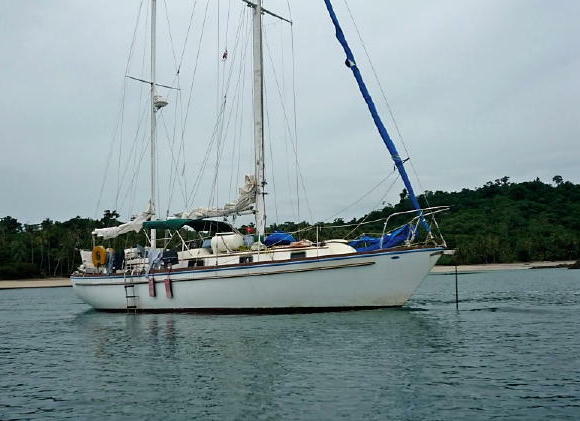 We started the engine and reversed our course to return to Boca Chica, where we would have access to David, a larger Panama town, where we could buy a new Genoa halyard. The one that had broken had no extra length, and was already too short, so it could not be trimmed and reused; and it was 7 years of cruising old. We are still navigating Panama. This adventure was not scary, but challenging. We are planning the trip again, leaving next Thursday. It may be a few weeks before we have internet access again, so don't expect to hear from us soon.